are all trademarks of Hasbro and are used with permission. ©2011 Hasbro. All Rights Reserved. 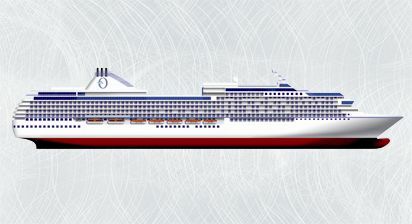 FUN SHIP 2.0 is the next wave of innovation from Carnival. Imagine everything you already love about a Carnival cruise, enhanced with new experiences that get you dancing more, laughing more and simply having more fun onboard. You've played CONNECT 4 and YAHTZEE games, but have you ever even imagined yourself onstage, in a competition that puts your gaming skills to the test? You'll have your chance with Carnival Cruise Lines' onboard Hasbro Game Shows, which take funtime favorites and infuses them with other games you know and love. From SORRY SLIDERS! to YAHTZEE BOWLING, CONNECT 4 BASKETBALL, OPERATION SAM DUNK and SIMON FLASH, you'll team up to win great prizes! John Heald, Senior Cruise Director of Carnival Cruises, and fellow CDs and ACDs were on-hand in Philadelphia, PA., to learn about the new game show experience which will be introduced starting with the roll-out of the brand new Carnival Breeze this June. "There will be a full evening dedicated to the show and I have to say that it’s going to be a great night of fun and excitement. The sets are huge and the games really will be crowd pleasers for sure." Last October, Carnival Cruise Lines announced $500 million dollars worth of enhancements spanning through 2015. The initiative, entitled "Fun Ship 2.0", builds on the success of Carnival Magic’s new branded experiences. Carnival Liberty was the first ship to undergo the face-lift, adding about half of the 11 new features. As Carnival Breeze comes closer to completion, the remaining features will be coming to the forefront. The new features belong to the following four categories. For added dining , TV personality and Celebrity Chef Guy Fieri has joined forces with Carnival to bring Guy’s Burger Joint. Guests will have the their choice of homemade burgers made with choice ground beef and complimented with hand-cut fries. This will be a lunch or dinner option for guests, topped off with their own condiment bar. Also added will be a new Cantina with Mexican delights like to order burritos and tacos. All complimentary. Comedian George Lopez has revamped the Punchliner Comedy club, adding some of his own talent and appearing on some of Carnival’s ships personally. The Punchliner Comedy Club Presented by George Lopez will have pre-recorded video and voice messages from Lopez. Carnival will launch Punchliner brunch as well offering entertainment in the main dining rooms on-board. Carnival is taking entertainment to the next level with Playlist Productions, 30-minute shows with LEDs, special effects, and sing alongs. Teaming up with game leader Hasbro, Inc. to create interactive game shows at seas. Also Carnival is teaming up with DJ Irie and creating Spin’iversity for folks who want to learn to mix music. By the end of 2012, three ships in the fleet will host 10 of the 11 new features of Fun Ship 2.0 with three more having at least 4 of the features. Even among those ships, there will be a variance in which features are deployed on each vessel. We've put a chart together, based on information that has been released to date, showing the features on each ship. We've also included the schedule so that you can plan your cruise vacation following the dry dock that will complete the transformation. You've heard the saying that a picture is worth a thousand words. Today, we decided to let some pictures tell the story that is still unfolding in the frigid Mediterranean waters off the coast of Giglio, Italy. To be honest, we've never even heard of the village of Giglio before the Costa Concordia accident. Although we've been to the Mediterranean, that wasn't on our tinerary, nor was it for the passengers of the Concordia. 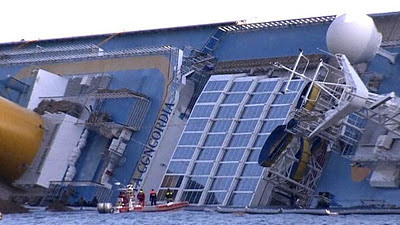 First pictures inside Costa Concordia following the tragic accident . Several areas of the ship are shown, including before and after pictures of the restaurant, as crews start to explore the ship for survivors and victims. Here is amazing footage from the search and rescue operations being carried out by the Italian Navy. It is in Italian, but you don't need a translation to understand the effort involved here. We salute the brave crews who are still working to account for all the passengers and crew of the Costa Concordia. Oceania Cruises announced that the debut of its next ship, the 1,250-passenger Riviera, has been delayed due to recent strikes at the Fincantieri shipyard near Genoa, Italy where it is being built. It is a sister ship to Marina which debuted last year. It was also built by the same shipyard. The maiden voyage of the 66,000-ton vessel has been pushed back to May 16 from April 2, 2012. 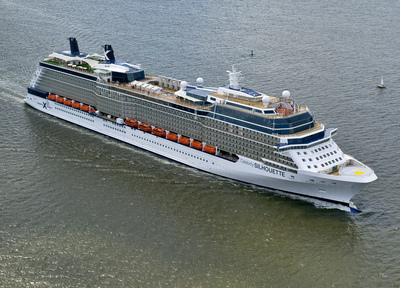 Two cruises scheduled to take place between April 24 and May 16 are being canceled. "We sincerely regret any inconvenience that this may cause our guests," Oceania President Kunal Kamlani says in a statement accompanying the announcement. "We are working very closely with the shipyard to ensure Riviera is completed to meet Oceania's high standards of quality and service." This is the second announced delay, within the last six months, to the maiden voyage of the Riviera. The line announced in August that the ship's debut was being pushed back from April 14 to April 24. Delays to maiden voyages, while rare, can happen for a number of reasons. In this case, a strike over reorganization planned at the shipyard due to a slowdown in newbuild orders, lasted longer than expected. Oceania says customers on the canceled cruises will be contacted by the line or their travel agents to discuss alternative cruise dates. Those who choose to rebook onto a later voyage will receive a credit ranging from $250 to $1,000 per person, depending on category of accommodation. Those who do not wish to rebook will receive a full refund. The new maiden voyage is a 10-day ‘Pearls of the Aegean’ cruise that includes an overnight aboard ship in Venice before departing for Dubrovnik, Kotor, Corfu, Monemvasia, Crete, Santorini, Delos, Mykonos and Athens. UNESCO has called on the Italian government to restrict access of large cruise ships to culturally and ecologically important areas, particularly Venice and its Lagoon which are visited by some 300 large cruise ships a year. In a letter sent to the Italian Environment Minister on behalf of Director-General Irina Bokova, the Assistant Director-General for Culture Francesco Bandarin writes that “the tragic accident [of the Costa Concordia on 13 January] reinforces longstanding concern over the risk that large cruise liners pose to sites inscribed on UNESCO’s World Heritage List, particularly the Venice Lagoon and the Basin of San Marco." After presenting UNESCO’s condolences for the tragic loss of life caused by Costa Concordia accident and praising the efforts of the rescue teams and local population in dealing with the disaster, the letter urges the government to act quickly to develop alternative plans for maritime traffic around the World Heritage site of Venice. UNESCO contends that the cruise liner traffic in Venice is particularly damaging because of the fragile structure of the city. The ships cause water tides that erode the foundations of buildings. They contribute to pollution and impact the cityscape as they dwarf monuments in the heart of the city. Those that follow our blog on a regular basis know that we were on Star Princess last May/June for a 12 Night Greek Isles & Mediterranean Cruise - Rome to Venice. Our captain urged us to be up on the outside decks before 7 AM to see the ship entering into Venice harbor. It was an amazing sight - seeing Venice from a different perspective. As you can see from these images, the pier where we were docked was far from the heart of the city. In fact, one must take a water taxi or use the people mover to get into the city proper. UNESCO's plea is not a new one, but it seems to have some new life as Italy's environment minister, Corrado Clini, appeared to take up the cause Tuesday. "The aim is to free St. Mark's basin from the big ships once new canals have been dug," Clini was quoted by the Italian news agency ANSA as saying during a public appearance in northern Italy. But Clini added that "in the meantime, it will be up to the port authority and to the city to decide which (sea) traffic is sustainable and compatible" with Venice's particular situation." Venice officials have said that since tug boats guide the big cruise ships through the part of the lagoon weaving through the city, the risk of accidents is virtually eliminated. In a city where "cars" are replaced by gondolas and small water craft, it is unthinkable that there could be a ban on larger vessels. Let us hope that the cruise industry, UNESCO, and Italian authorities can work out a plan which protects Venice for years to come and still allows future generations the pleasure of seeing this amazing city of canals from the perspective of a cruise ship. If a Mediterranean cruise, that includes Venice, is on your bucket list, you might want to plan that trip now in case restrictions are indeed put in place in the near future. Upon becoming aware of the evacuation of Costa Concordia, SMIT approached the owners and underwriters of the Costa Concordia bidding for the salvage contract. SMIT has an extensive track record relating to marine emergency response, refloating stranded vessels and wreck removals. In the days following the accident, a contract was awarded by the Owners to SMIT and local partners Tito Neri for the removal of the bunker oil and pollution control. The estimated amount of bunkers in the vessel is 2200 MT of IFO (intermediate fuel oil), 185 MT of MGO (marine gas oil/diesel) and lubricants, distributed over 17 tanks. We have seen conflicting reports of the amount of fuel. The latest number we have seen involves 13 double-bottomed tanks and 10 single-bottom tanks. In the days following the accident, a contract was awarded by the Owners to SMIT and local partners Tito Neri for the removal of the bunker oil and pollution control. SMIT Salvage placed its work/crane barge Meloria, pictured above, alongside the Costa Concordia. Divers from SMIT Salvage will then inspect parts of the underwater ship and make the necessary preparations to remove the fuel from the ship. Next stage will be the drilling of holes in the fuel tanks and the installation of valves by means of a hot tap. While the fuel has been submerged, it has become solidified. A hot tap is used to heat the fuel back into a liquid state so that it can be extracted. This process will take several weeks with current estimates at 4 to 6 weeks. This post will provide updates on the fuel salvage operations. This morning at 08.00 CET SMIT Salvage successfully completed its assignment on the removal of fuel from the Costa Concordia. Over the last couple of days, the SMIT Salvage diving team transferring HFO from the last settling tank in the engine room. Early this morning, the last tanks were completed, closed and sealed off. The entire oil removal process which lasted just over one month went smoothly and was executed in line with expectations. Most of the diving and pumping equipment will be demobilized and brought back to Livorno onboard of the crane/work barge Meloria. SMIT will retain a small diving team and a diving foreman on the island under a so-called ‘caretaker contract'. The SMIT Salvage team will remain standby on the island for designated emergency duties until a contractor is appointed for the removal of the entire ship. 2,400 tons of oil have been removed from the ship. This process took five weeks to complete. The ship still must be monitored for leaks and further cleanup efforts are pending, including the ultimate removal of the ship. Six companies have submitted bids to Costa Cruises for the removal. This afternoon the salvage team completed the discharge of Heavy Fuel Oil, Diesel Oil and Sludge from the Double Bottom Tanks. Weather permitting the crane barge Meloria will now be moved forward in her moorings in between the stabilizer and the large damaged area. An access hole will be created in the hull to allow the divers to enter the engine room spaces where the settling and service tanks are located. Once the connections have been installed, the contents will be transferred to the offloading tanker. Thereafter the contents of the sewage tanks will also be pumped out of the ship. Salvage workers have extracted 1,300 cubic metres of fuel from six tanks, equivalent to two-thirds of the total on board. Oil has been removed from all six forward tanks and the hoses, pumps and valves have been disconnected with the flanges sealed off. Following the successful oil removal from the forward ship, the crane barge was disconnected and brought back into the sheltered port on Monday morning. The fuel tanker 'Elba' into which the fuel was pumped has moved away from the Costa Concordia and a second fuel barge 'Magic Duba' is standby to replace the 'Elba'. Since Monday, the wind and wave conditions have hampered the continuation of the oil removal process. As soon as the weather permits, the crane barge will be repositioned alongside the Costa Concordia. Based on the current planning, the mid-ship tanks containing MGO and two double bottom sludge tanks will have the next priority. These tanks will also be emptied using the hot tap method. Due to the unpredictable weather conditions, SMIT cannot provide an estimated date of completion. Yesterday afternoon, at 16.55, the first oil was removed from the Costa Concordia. In line with the presentation made on the January 28, the initial operation is focused on the forward fuel tanks. Currently four of the six forward fuel tanks have now been installed with a sealable flange. As operations continue, the remaining tanks will also be prepared. The first tank which was connected to the pumps is relatively small and located on the port side of the Costa Concordia. The weather forecast for the coming days looks good and pumping will continue around the clock as long as the favorable conditions continue. Underwater pumping operations began Sunday to remove some of the 500,000 gallons of fuel aboard the Costa Concordia, after nearly two weeks of delays because of rough seas and bad weather. The removal operations will run 24 hours a day. The forecast for the next several days is favorable, so it is the hope of SMIT, who is running the operation, that the majority of the fuel in the forward tanks can be drained by week's end.This would represent about 60% of the fuel. It will take approximately 28 consecutive days of pumping to empty the tanks. Two of the six forward fuel tanks have now been installed with a sealed flange and the remaining tanks were due to be prepared today. The six forward tanks are estimated to hold approximately two thirds of the (intermediate) fuel oil in the casualty. Unfavorable weather once again played a role and the crane barge was disconnected from the casualty and brought into the protective port of the island Giglio. Installation of hot tap valves on the outer hull of the vessel and drilling of holes through the hull into the oil tanks must be done before pumping of the oil can commence. What goals did you have for you teen years? Did you ever consider sailing around the world by yourself before turning 17? Well, Laura Dekker, a young Dutch girl had that dream and Sunday she completed her goal, breaking the previous record by almost 8 months. 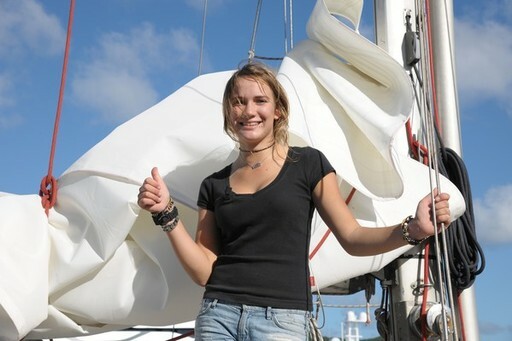 Dutch born 16-year-old Laura Dekker sailed into the harbor of St Martin, completing a journey around the world which began last August from this Dutch and French island in the Caribbean. In order to beat the world record, she needed to complete the circumnavigation at least 3 days before her 17th birthday which is September 20, 2012. Previous record holder, Australian Jessica Watson, completed her trip in May 2010, three days before she turned 17. The two journeys were slightly different with Laura sailing no more than three weeks at a time, stopping in various ports along the way while Jessica sailed non-stop around the world. "I can't really take in what I've done," she told reporters once back on dry land. "The sailing was always nice... I often saw dolphins. I enjoyed it a lot and I'm very happy." Laura had a struggle to overcome before even setting sail. The Dutch courts had blocked plans for her to cast off two years ago, saying she was too young at 14. In July 2010, the Dutch child welfare authorities finally allowed her to depart on her journey. Her parents and a small group of well-wishers were on hand for her homecoming on Sunday. Congratulations for accomplishing such a task at such a young age. For those of you that aren't quite as adventurous as Laura, you can leave the driving to someone else by joining as passengers on one of the cruise line's World Cruises. The first day of the Chinese New Year – which begins at midnight on January 23, 2012 – is the most important of Chinese holidays, celebrated by billions in China, and by millions of ethnic Chinese around the world. It’s a celebration that lasts for 15 days, culminating with the Lantern Festival. Each year is associated with one of twelve animals in the Chinese zodiac. For 2012, it’s the Year of the Dragon. The Dragon is a creature of myth and legend. A symbol of good fortune and sign of intense power, the Oriental Dragon is regarded as a divine beast - the reverse of the malicious monster that Westerners felt necessary to find and slay. In Eastern philosophy, the Dragon is said to be a deliverer of good fortune and a master of authority. Therefore, those people born in Dragon years are to be honored and respected. The Chinese New Year does not fall on a specific date, so it is essential to check the calendar to find the exact date on which each Dragon Year actually begins. during a mass celebrated on Sunday in the Isola del Giglio's church. Perched atop a hill overlooking the waterfront, The Lorenzo e Mamiliano Church became a safe haven for passengers of Costa Concordia, that had been rescued from the sinking ship on 13 January 2012. Father Lorenzo tended to their spiritual and technological needs that weekend as he offered prayers and the use of his computer, so that families could contact love ones to tell them they were safe. One week later, Father Lorenzo once again offered prayers, during Sunday mass, for the victims of this terrible tragedy providing reassurance and comfort to the families still awaiting word about their loved ones. It is fitting that this church sits atop a hill overlooking the port where Costa Concordia sits perched precariously on the rocky shore. When people look up hoping for answers, they see this church, and can take comfort that God is still watching down on those that work tirelessly to find the remaining victims. Many of the town's people of Giglio have opened their homes and hearts to the passengers and relatives who have unexpectedly converged on this tiny Italian village. This Madonna statue, rescued from the Costa Concordia, is another symbol of hope amidst this tragedy. Mary's eyes seem to be looking into our very souls providing reassurance and comfort. The sounds of the rescue continue to fill the air near the stricken ship while atop this hill, there can be a retreat from those sounds allowing for thoughts and prayers for the victims, families, friends, survivors, and anyone involved in this incident. The port of Galveston is a great place to start your cruise vacation. The boardwalk has shops and restaurants for you to enjoy before departure. Due to dense fog (zero visibility) Galveston channel was closed today. Therefore, Carnival Triumph’s arrival today Saturday, January 21st was delayed until conditions improved sufficiently for the channel to reopen for marine traffic. Carnival Triumph remained at anchorage at the pilot station. It looks like the fog is starting to clear nearer to the terminal and the island. It’s still pretty thick where we are. In his last announcement, Captain Los said that we might be able to board the pilot by 11:15am. This would put us alongside at 12:45pm or 1:00pm. At this point, the phone lines have been opened and are complimentary so that guests can update/change travel arrangements. We’re going to start serving lunch in about an hour. Hopefully, the fog will clear soon. It is out of respect for the passengers, family, and crew of those aboard Costa Concordia, that we have been restricting our posts to that accident and related safety information. We will continue our coverage of that tragedy, but will once again start to return to coverage of other topics of interest to our readers. We thank you for your understanding. Please continue to pray for all those impacted by this tragedy. Carnival Corporation & PLC is the parent company of Costa Cruises, and as you might imagine, has fallen under scrutiny of the entire world as this tragic accident continues to dominate the news. Carnival is not burying its head in the sand and ignoring the situation, but besides assisting those directly impacted by the accident, they are taking an internal look at safety within their entire fleet which consists of 10 cruise lines. Through their Facebook site, they are also answering safety concerns of their guests and providing updates on the Costa Concordia. If I were CEO of the largest cruise line company, I might be thinking something along the following lines... Everyone would love to turn back the hands of time so that this tragic event could be prevented, but unfortunately that is not possible. We must learn from this, and take steps to make sure this doesn't occur again in the future. Carnival Corporation regards safety as number one priority and will review our safety training and procedures on each of our cruise lines taking any necessary corrective actions discovered during the review process. That is not a direct quote by any means, but based on various comments on their Facebook page and in the media, it's not that far off from reality. We too would like to do our part to reinforce safety procedures at sea and to try to answer concerns of our readers utilizing information from Carnival Corporation, CLIA, and other sources. 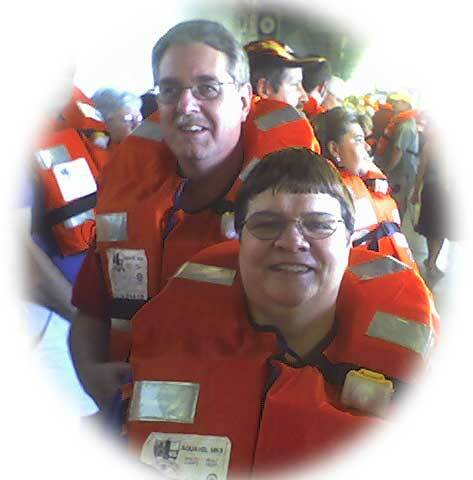 If you are a past guest of Carnival Cruise Lines, you will recognize this video. For the benefit of those who haven’t seen it before, what follows is the safety video shown onboard all Carnival Cruise Lines ships. They use this to help inform guests of procedures to follow in an emergency situation. It is much like videos you'll find on commercial airlines. Safety is everyone's responsibility - please pay attention to the video as well as familiarize yourself with emergency exits, signs, and other safety related information before you sail. Q. Many of you have asked about our ships navigation systems and if we have equipment to detect rocks and depth. A. All of our ships are equipped with the most advanced navigation technology and our officers are expertly trained in its use. Our ships are equipped with two independent depth sensors that can detect variations in ocean floor depth. Further, we have several radars, GPS, electronic charts, gyros etc for safe navigation in all conditions. All bridge systems have a redundant back-up system in case of system malfunction. As part of our comprehensive bridge team management system, we always have multiple people on the bridge watch. Q. Some of you are asking if it’s safe to go on a cruise. A. The safety of Carnival Cruise Lines' passengers and crew is our number one priority and we have an excellent record of safe operation throughout our company’s history. Cruising continues to be one of the safest means of travel and marine accidents are an extremely rare occurrence. All of our ships meet or exceed international safety and training requirements, and are equipped with the most advanced navigation technology, which our officers are expertly trained to use. Q. 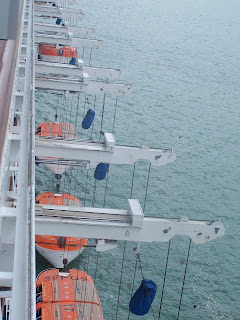 Many of you have asked about evacuation & emergency procedures and training on cruise ships. A. All Carnival Cruise Lines vessels meet or exceed international safety and training requirements. All of our ships also conduct emergency response drills every 3 – 6 months with the U.S. Coast Guard. All of our ships comply with international rules that require these drills to be done within 24 hours of departure and in almost all cases, Carnival Cruise Lines' ships do it prior to sailing. Finally, all of our crew members undergo comprehensive safety training and we are constantly evaluating and updating their training to make sure they are prepared for any emergency. Carnival Corporation continues to respond to questions from guests and we will share additional information as it becomes available. We too would be happy to respond to your concerns. See our Contact tab for ways to reach us. All of us in the industry are deeply saddened by these events and pray for all those that lost their lives or were injured, for their families and friends, for the crew, for the rescue workers, for anyone in the Carnival "family" who have been touched directly by this event. MIAMI – January 19, 2012 – Following the tragic Costa Concordia accident, Carnival Corporation & plc, parent company of Costa Cruises and nine leading cruise lines around the world, today announced a comprehensive audit and review of all safety and emergency response procedures across all of the company’s cruise lines. Carnival Corporation & plc and the cruise industry as a whole have maintained an excellent safety record over the years. “However, this tragedy has called into question our company’s safety and emergency response procedures and practices,” said Micky Arison, chairman and CEO of Carnival Corporation & plc. The review is being led by Captain James Hunn, a retired U.S. Navy Captain and currently the company’s senior vice president of Maritime Policy & Compliance. Following a 32-year career in the Navy, Hunn has held senior positions at Carnival Corporation & plc for nearly a decade, focusing on corporate-wide efforts to establish maritime policy standards, while overseeing the company’s health, environmental, safety, and security practices. Passengers that were booked on Costa Concordia had until February 7th to determine what alternative arrangement they wished. Costa neoRomantica and Costa Magica will offer Western Mediterranean itineraries, so travelers can sail as planned, but on a different ship. The Associated Press today is reporting that Costa Cruises is offering survivors of the Costa Concordia accident 11,000 Euro (about $14,500) per person as compensation for their lost baggage as well as the psychological trauma they suffered during the event. This amount is in addition to reimbursing passengers for the full amount they paid for the cruise, their travel expenses and any medical expenses sustained after the accident. Costa made this announcement after negotiations between Costa representatives and Italian Consumer groups. It does not apply to passengers that were injured or killed, who presumably will be offered more. Roberto Corbella, who represented Costa in the negotiations, told The Associated Press the deal offered Friday provides passengers with quick, "generous," and certain restitution. "The big advantage that they have is an immediate response, no legal expenses, and they can put this whole thing behind them." AP also reports that Codacons, one of Italy's best known consumer groups, has engaged two U.S. law firms to launch a class-action lawsuit against Costa and its parent company, Carnival Corporation & PLC, on behalf of passengers, claiming that it expects to get anywhere from $164,000 to $1.3 million per person, the Associated Press says. As recovery efforts are ongoing for Costa Concordia following the tragic accident Friday 13 January, future sailings on that vessel are cancelled for the near-term. It is unknown whether the ship will ever return to service. At present, the hope is that the fuel can be removed and prevent any environmental impact before bad weather approaches later this week. Costa has released compensation guidelines for passengers scheduled to sail on Concordia this week through February 25th. For passengers scheduled on the January 14 departure from Savona, Italy, Costa worked with guests and their airlines to return home. Airline changes will be paid by Costa. A full refund of the cruise amount plus a 30 percent future cruise credit on the amount paid will be provided. If guests choose to rebook on available sailings in January through March on Luminosa, Mediterranea, Favolosa, Serena or Voyager, Costa will pay for their air fare if booked through Costa’s air/sea department. Rebookings must be made by January 18. Guests who choose to cancel their cruise on departures from January 15 through January 20 will get a full refund of cruise fare plus a 30 percent future cruise credit on the amount paid. No compensation for air will be provided if they are cruise-only passengers. For passengers who choose to rebook in January, February or March according to availability on Luminosa, Mediterranea, Favolosa, Serena or Voyager, Costa will assist the guest and airline on change fees. Guests who choose to cancel sailings departing from January 21 through February 25 will get a full refund plus a 30 percent future cruise credit on the amount paid. No compensation for air will be provided for cruise-only guests. Those who rebook can choose any seven-day cruise between now and June at the same price. Costa will assist the guest and work with the airline on change fees for their new cruise on Costa. For assistance or more information, call 800-462-6782. We continue our coverage of this extraordinary event by bringing you a selection of images that are equally extraordinary. On Friday, 13 January 2012, over 4,000 passengers and crew set sail from Civitavechia, Italy, on a Mediterranean voyage which would take their ship past the small village of Giglio. The captain of their vessel decided to salute the town and some of its inhabitants, that had a tie to the cruise line, and sail close by to shore. There was a rocky coast line, but since they were marked on his charts, he felt that they could safely be avoided. He wasn't the first captain to do a sail-by like this, but unfortunately, human error or perhaps equipment failure turned a seemingly innocent maneuver into a tragic event. Since late Friday night, a monumental rescue and recovery effort has been underway just offshore Giglio. Fortunately, the majority of the passengers and crew were safely evacuated, however as of this writing, 6 people have perished and 29 are unaccounted for. As the hours progress, the chances of finding them alive diminishes. For the first day or so, the weather cooperated with the rescue workers and they were able to work non-stop, even in darkness. Monday, that all changed as the seas picked up and a light drizzle fell. All work had to stop when the ship shifted slightly. The rescue efforts have resumed again, but now there is another concern. A liquid leaked from the ship causing alarm that this could also turn into an environmental disaster. Barriers are in place to contain any spill that may occur. There remains 500,000 gallons of fuel onboard the vessel in 17 tanks according to Costa Cruises. The mayor of Giglio and environmentalists anxiously await the removal of the fuel. A salvage company has been employed by Costa Cruises to begin the fuel recovery once rescue efforts have been completed. If the fuel were to be removed during the rescue efforts, the ship could slip again, increasing the danger of the operation. Why was the ship so close to shore? Was it human error or faulty maps or equipment? Why was the evacuation delayed? Why did the captain leave the ship while evacuation was ongoing? Was the crew adequately trained? Were procedures ignored or do they need to be improved? The "black boxes" have revealed some interesting facts already, making many wonder why the captain took various actions he did on that fateful night. The investigation will provide answers. Undoubtedly those in the wrong will be held accountable. The industry will learn from these events and take corrective action, just as it did almost 100 years ago when the Titanic hit a very similarly shaped submerged object. Please keep everyone impacted by this tragedy in your thoughts and prayers. While the ship will ultimately be repaired, some lives will never be the same. Our hope is that out of tragedy good will emerge. The World Maritime Day theme for 2012 is “IMO: One hundred years after the Titanic”, which will focus on the Organization’s roots and safety of life at sea. We had planned to write about this closer to the anniversary of the sinking of the Titanic, but with the activities of this weekend in Italy, thought that it would be a good time to share the progress that has been made by the International Maritime Community since that tragic day nearly100 years ago. This article will highlight changes that were implemented as a result of the Titanic sinking. Undoubtedly, there will be lessens learned from the Costa Concordia accident, and the next SOLAS Convention will perhaps recommend additional safety changes. One of the consequences of the sinking, in 1912, of the Titanic, in which more than 1,500 people lost their lives, was the adoption, two years later, of the first International Convention for the Safety of Life at Sea (the SOLAS Convention). The 1914 version of the Convention was gradually superseded, respectively, by SOLAS 1929, SOLAS 1948, SOLAS 1960 (the first adopted under the auspices of IMO, then known as IMCO) and SOLAS 1974. SOLAS 1974 is still in force today, amended and updated many times. In the first SOLAS 1914, after the Titanic disaster, ice patrols in the north Atlantic were set up and continue to be a SOLAS requirement. excessive speed at which she was being navigated. Under SOLAS, when ice is reported on or near his course the master of every ship at night is bound to proceed at a moderate speed or alter course. There was no public address system on the Titanic and news filtered to the passengers slowly, adding to the disorder and confusion. Under SOLAS, all passenger ships must be fitted with a public address system. The crew of the Titanic lacked training in loading and lowering the lifeboats and few knew which boat they were assigned to. Lifeboats were not filled to capacity because senior officers did not know the boats had been tested and were strong enough. Under SOLAS, every crew member must participate in regular practice drills and have easy access to training manuals. Some people died from hypothermia in the Titanic lifeboats because they were open and gave no protection against the cold. Under SOLAS, lifeboats must be fully or partially enclosed. On passenger ships, partially enclosed lifeboats can be used as they are easier to get into, but they must have a collapsible roof to fold across. The Titanic did not have enough lifeboats for all passengers. 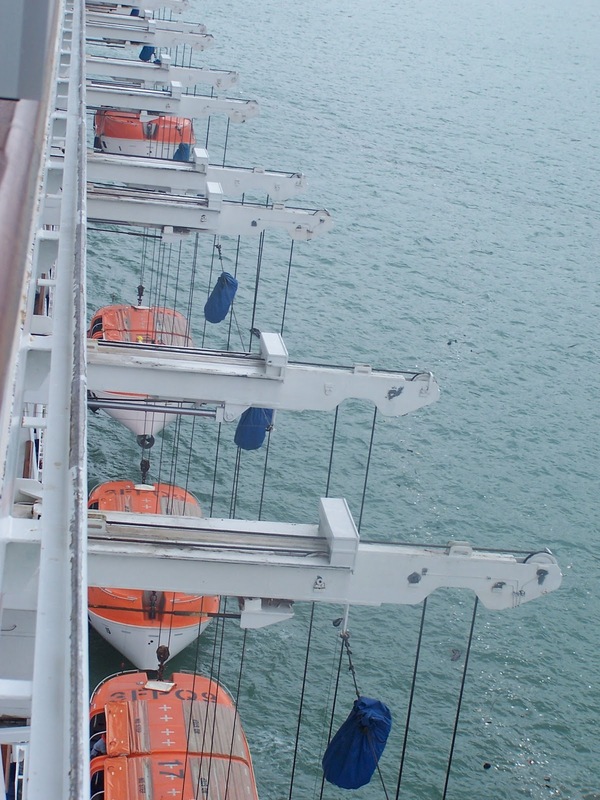 Under SOLAS, passenger ships must carry enough lifeboats (some of which can be substituted by life rafts for all passengers, plus life rafts for 25%. The sea temperature when the Titanic sank was below freezing point and many people died in the water from hypothermia. Under SOLAS, a specific number of immersion suits must be carried on both passenger and cargo ships, mainly for the crews of rescue boats. The land station at Cape Race, Newfoundland and ships other than the Carpathia and the Californian heard the Titanic distress call but the airwaves were crackling and the Titanic’s position was misinterpreted. With EPIRBs and global positioning systems, the position of a ship in distress can be automatically sent. The Californian was less than 20 miles away but the radio officer had gone off duty when the distress messages were sent. Under SOLAS, every ship while at sea must maintain a continuous watch on the distress and safety frequencies. The Titanic used radio which had a limited range of 200 nautical miles. Ships can now communicate globally via satellites. Unavailable in 1912, helicopters and rescue planes are now used to locate, search for and rescue survivors. No lifeboat drill was held on the Titanic. Under SOLAS chapter III an ‘abandon ship’ and fire drill must take place weekly on all passenger ships. (This is usually held before sailing, but must be completed within 24 hours of embarkation). Passengers on the Titanic jumped from windows and doorways into the lifeboats as they were lowered, often injuring themselves or other passengers New emergency evacuation chutes are both safer and quicker. It has always been recognized that the best way of improving safety at sea is by developing international regulations that are followed by all shipping nations and from the mid-19th century onwards a number of such treaties were adopted. Several countries proposed that a permanent international body should be established to promote maritime safety more effectively, but it was not until the establishment of the United Nations itself that these hopes were realized. Read more about IMO's history. Fort Lauderdale, FL — January 14, 2012 — The Cruise Lines International Association is closely monitoring the situation with the Costa Concordia. The immediate focus is on attending to the incident at hand, and ensuring the safety and accounting for passengers and crew to the fullest extent possible. On behalf of the Global Cruise Ship Industry, we would also like to pay tribute to all those who worked tirelessly to evacuate the ship to help minimize casualties. CLIA would also like to reassure other cruise ship passengers that all CLIA member lines are subject to the highest safety standards around the world and according to international maritime requirements. The nonprofit Cruise Lines International Association (CLIA) is North America's largest cruise industry organization. CLIA represents the interests of 26 member lines and participates in the regulatory and policy development process while supporting measures that foster a safe, secure and healthy cruise ship environment. CLIA is also engaged in travel agent training, research and marketing communications to promote the value and desirability of cruise vacations and counts as members 16,000 travel agencies. For more information on CLIA, the cruise industry, and CLIA-member cruise lines and travel agencies, visit www.cruising.org. CLIA can also be followed on the Cruise Lines International Association's Facebook and Twitter fan pages. Have you ever wondered if there's a way to find out where a ship is located? There are many times when you might be curious about the location of a cruise ship or other vessel. The most practical situation that comes to mind is when hearing about inclement weather or some other natural disaster. Are there any ships in danger? The system is based on AIS (Automatic Identification System). Since December 2004, the International Maritime Organization (IMO) requires all vessels over 299GT to carry an AIS transponder on board, which transmits their position, speed and course, among some other static information, such as vessel’s name, dimensions and voyage details. The chart above is a live interactive map generated by MarineTraffic.com, an academic, open, community-based project. It is dedicated to collecting and presenting data which are exploited in research areas such as simulation of vessel movements in order to contribute to the safety of navigation and to cope with critical incidents. AIS is initially intended to help ships avoid collisions, as well as assisting port authorities to better control sea traffic. AIS transponders on board vessels include a GPS (Global Positioning System) receiver, which collects position and movement details. It includes also a VHF transmitter, which transmits periodically this information on two VHF channels (frequencies 161.975 MHz and 162.025 MHz – old VHF channels 87 & 88) and make this data available to the public domain. Other vessels or base stations are able to receive this information, process it using special software and display vessels locations on a chart plotter or on a computer. We want to express our deep gratitude to the Italian Coast Guard and local authorities and community members who have gone to extraordinary lengths to assist in the evacuation of the ship and provide support for our guests and crew. We are working to fully understand the cause of what occurred. The safety of our guests and crew members remains the number one priority of Carnival Corporation & plc and all of our cruise lines. Costa Concordia was sailing on a Mediterranean cruise from Civitavecchia (Rome) with scheduled calls at Savona, Italy; Marseille, France; Barcelona, Spain; Palma de Mallorca; Cagliari and Palermo, Italy.